UL Listings For Lighting & Ceiling Fans: What Do UL Ratings Mean? What exactly do UL ratings mean? What is a damp location versus a wet location? And when is it safe to use a fixture outdoors where the presence of water is inevitable? Here's a quick guide to everything you need to know about UL Listings for lighting and ceiling fans. Is it rated for dry, damp or wet locations? What does UL mean? What is the difference between UL and ETL? Most of the ceiling lights, wall lights, outdoor lighting and ceiling fans sold in the United States have been tested and rated by Underwriters Laboratories (UL), an independent product safety certification organization. Conversely, some products have been tested by Intertek and carry an ETL Listed mark. Whether its UL or ETL depends on the product and either rating can help you choose the most appropriate fixture for your needs. Often noted just as "UL Listed." A dry location is an indoor area that is not normally subject to dampness. It may include a location subject to temporary dampness provided ventilation is adequate to prevent any accumulation of moisture. Dry Locations include kitchens, living rooms, dining rooms, bedrooms, foyers, hallways and most areas in bathrooms. Only lighting fixtures and fans marked "Suitable for Damp Locations" or "Suitable for Wet Locations" can be used in damp locations. A damp location is an exterior or interior location that is normally or periodically subject to condensation of moisture in, on or adjacent to the electrical components of a lighting fixture or ceiling fan. Indoor Damp Locations include indoor pool areas, utility rooms and over bathtubs or showers in bathrooms (without risk of direct water contact). Outdoor damp rated fixtures can only be used in covered, fully protected locations that are not directly exposed to water, even during storms. Outdoor Damp Locations include covered patios and covered porches that are fully protected from water, even during storms. Only lighting and fans marked "Suitable for Wet Locations" can be used in wet locations, both indoors and outdoors. A wet location is an interior or exterior location in which water or other liquids may drip, splash or flow on or against the electrical components of a lighting fixture or ceiling fan. Outdoor Wet Locations include open-air decks and patios, uncovered porches, outdoor dining areas, exterior walls, gazebos, pergolas and walkways. Indoor Wet Locations include shower enclosures. 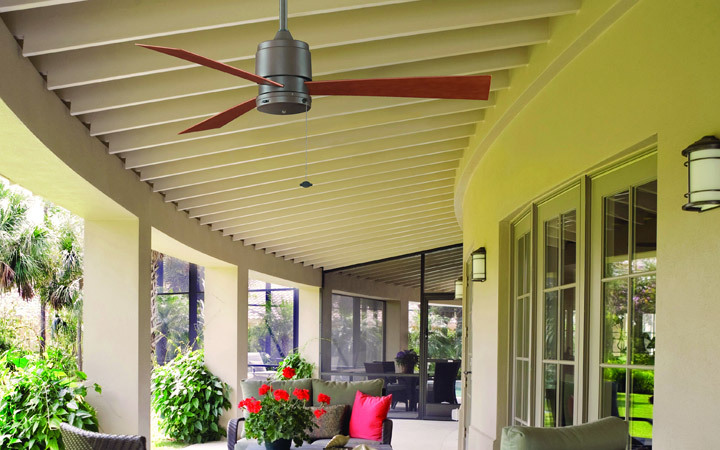 When shopping for lighting or a ceiling fan for your home, be sure to review its UL Listing or ETL Listing to ensure it is the right fixture for your situation.